Allegations of harassment and bribery were levied against a high-ranking Democratic official in Springfield Thursday, and NBC 5's Mary Ann Ahern has all the details. 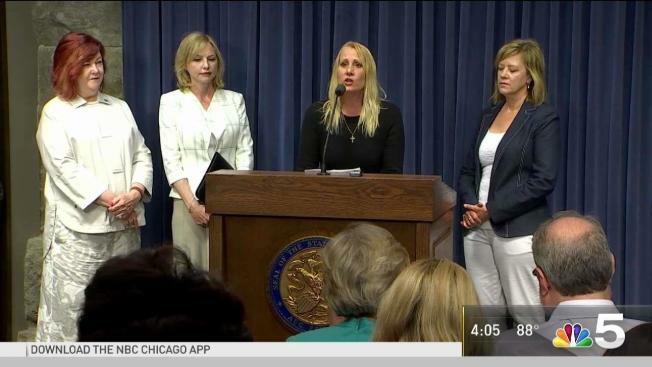 On the final day of Illinois' legislative session, a female activist accused Deputy Majority Leader in the House Rep. Lou Lang of abuse during a news conference in Springfield. Moments later, Lang announced his resignation from his political leadership post. The woman, who was identified as Maryann Loncar, said she was harassed, intimidated and humiliated after she "rejected the inappropriate actions of Rep. Lou Lang." "I have everything to lose by coming here in front of all of you – everything," she said. Loncar alleged in a release that Lang "committed terrible acts against her while she advocated for a bill that he sponsored." Among those acts were accusations that Lang placed his hand on her lower back, below her underwear line, while saying, "Does your husband know how lucky he is to have a wife like you?" He also allegedly called her to say "I would have dinner with you if you weren't with your husband," Loncar said, adding that when she rejected the alleged advances, he "isolated, discredited and blackballed" her from Springfield. Lang allegedly told Loncar's ex-husband he could "help you bury her if you want," Loncar said. She added that she received threats ahead of her Thursday announcement and called for an independent investigation. "The moral compass in Springfield is broken," she said. Lang is the Deputy Majority Leader in the House, and one of the chamber's most senior members, having represented the 16th District - encompassing parts of Skokie, Lincolnwood and Chicago - since 1987. He also serves as the executive vice chair of the Cook County Democratic Party and was the chief House sponsor of the Equal Rights Amendment which passed just the day before the allegations surfaced. Moments after the press conference, Lang released a statement staying he submitted a "former request to the Special Legislative Inspector General to begin an immediate investigation." He added that "after consultation with Speaker Madigan" he has decided to resign from his leadership position. Lang was seen entering the Capitol on Thursday, but remained out of sight during the busy final day of session - not even stepping foot on the House floor to cast his vote on the budget. “I appreciate the courage it takes for individuals to come forward to share their experiences, and in doing so urge us all to do better," Madigan said in a statement. “Representative Lang has already requested that the legislative inspector general immediately conduct a full investigation of these allegations and I’m hopeful she will conduct this investigation quickly and thoroughly." Loncar called in to a radio show Thursday morning to detail the "unexcusable behavior" she said she endured. "I came down as an advocate on my own time and my own money helping citizens of Illinois with legislation and bills that I thought would change my life and the people of this state and as I have done that, certain leaders have held bills that I was working on, and when we didn’t go along with what they wanted to do and how they wanted to change these certain bills and we voiced our opinions on this, we were humiliated, we were blackballed, we were threatened," she said in the interview. "This is unexcusable behavior for anybody in society, let alone people that are supposed to come here on behalf of doing the people’s work. It’s unacceptable," she continued, saying that the abuse included "screaming, swearing, anger beyond what I’ve ever seen." Loncar said she made the decision to come forward because she "can't stand here as a bystander any longer and watch all these credible women be discredited." Standing by her side during the Thursday announcement was Denise Rotheimer, an activist who accused state Sen. Ira Silverstein of sexual harassment during a hearing in October 2017. Illinois' legislative inspector general - who was appointed just days after Rotheimer's allegations brought the post's roughly four-year vacancy to light - found that Silverstein behaved inappropriately but did not harass her. Silverstein, a Democrat representing parts of Chicago's North Side, lost his primary election in March. Loncar said her experience was similar to allegations brought forth by other people who have come forward, including state Rep. Kelly Cassidy, who alleged retaliation from House Speaker Michael Madigan after she spoke out questioning his office's handling of harassment claims. "It’s what everybody else is talking about," Loncar said Thursday morning. "It’s Representative Cassidy and other people that stand up and say if you don’t conform and go along with everything they tell you, regardless of your own morals, your own mindset, you will be blackballed and that you will be treated unfairly and you will be harassed and you will be singled out. And no matter how many times you go through a video for 15 minutes and answer questions on sexual harassment, that’s not enough. That’s not enough."